Having the appropriate seating in the office is necessary. Important meetings happen in communal spaces where co-workers gather to discuss business strategies. Employees take breaks from work and enjoy lunch together in kitchen areas. Before entering the office, guests and prospective employees look for comfy places to sit down to get down to business. No matter the size or style of your office, having a set of versatile folding and stacking chairs makes sitting anywhere possible. They’re a great investment for the whole company and can be pulled out when you need them and conveniently tucked away when you don’t. When deciding between these two chair options, here’s what you need to know. Folding chairs are easy to work with and are economical. They’re especially useful for large meetings and can be set up quickly and put away just as easily. If your company has all-hands meetings, these chairs may be the best option. Rows of chairs can be put in place minutes before the meeting by employees themselves and stored after speeches and discussion have ended. Why invest in permanent, expensive seating when you can use foldable office chairs temporarily for your convenience? 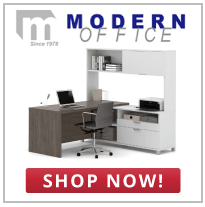 In addition, folding chairs are quite comfortable – especially when purchased from Modern Office. We stock a variety of quality folding chairs made with many different materials. Choose from metal, cushioned, resin, fabric, and vinyl options. Whatever style you decide on, you’ll feel comfortable in a foldable chair built for your contentment. Equally important, these chairs are highly versatile and appropriate for all office spaces. We offer foldable office chairs in different materials, so your business can choose what you need to match your office décor. We’ve got chairs for waiting rooms, ballrooms, cubicles, lunch rooms, and so much more. There’s no room that won’t look good with the addition of versatile and comfortable folding chairs. 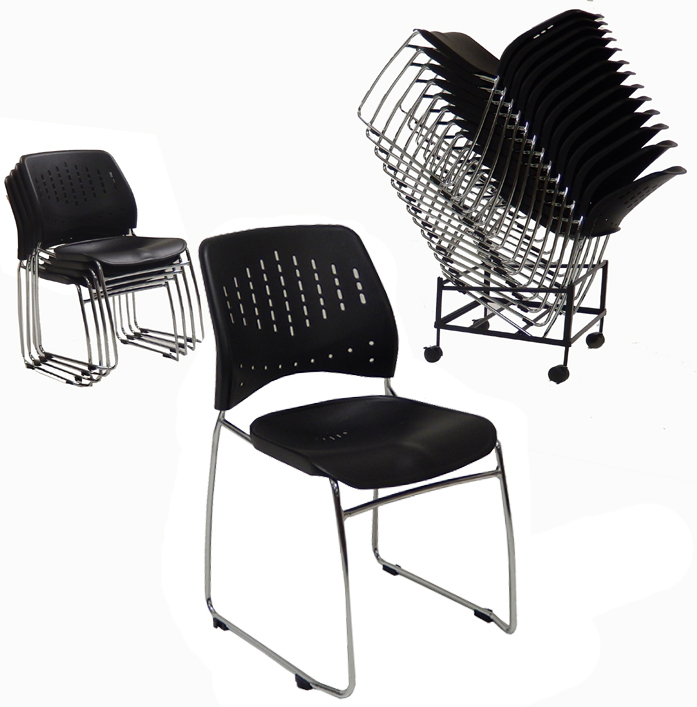 Stacking chairs are well suited to offices with ample room. Rows of chairs are laid out for important presentations and neatly stacked away after company meetings are through. Lightweight and clean, they’re easy to move around and stack forget about moving bulky and heavy items when you invest in these chairs. You may just make your life and the life of your employees easier. Like folding chairs, stacking chairs offer the comfort necessary for relaxation and focus. They come in a variety of designs, offering minimalist and extravagant options. Choose from economical plastic stack chairs, flip stack chairs with comfortable flip-up cushions, or wooden stacking chairs. All designs are quality made, ensuring the comfort of anyone who sits in them. Lastly, like foldable office chairs, stacking chairs come in many shapes and sizes and are made with many different materials. Due to their diverse styles, chairs can be selected with specific uses in mind and can be placed in casual, professional, or formal settings. Wooden stacking chairs are a popular choice for banquets or other sophisticated events. Minimalist chairs may be the best affordable option for casual team meetings and classroom settings. At Modern Office, we’ve got stacking chairs for every occasion and setting. Contact us today and speak to our furniture experts who are well-versed in our full range of products. We look forward to serving you.